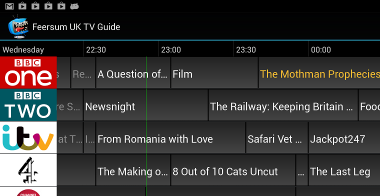 Available through the Play Store and compatible with most Android devices, the Feersum UK TV Guide provides full UK broadcast schedules with a responsive and natural interface. Designed from the start to work equally with tablets and smaller screens, the guide has received consistently high reviews and enjoys a loyal following. 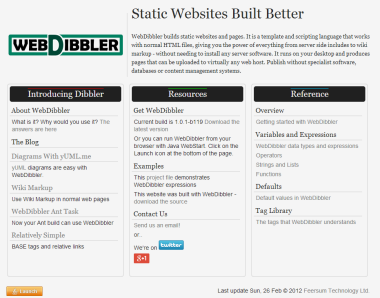 WebDibbler builds static websites and pages. It is a template and scripting language that works with normal HTML files, giving the power of everything from server side includes to wiki markup - without needing to install any server software. A simple Java utiltiy, it is designed to be integrated with build systems to automate the production of sites from developer content. 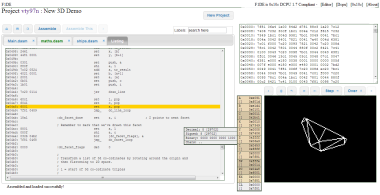 F1DE is an experiment in cloud-based microprocessor development tools. A browser based front end allows projects to be developed based on a virtual processor, the DCPU. Server side tools manage the project, providing a fully featured macro assembler, simulator and debug components. HTML 5 elements render a simluated video display in real time. © 2016 Feersum Technology Ltd.